Ready-mix concrete producers use chemical admixtures to reduce the cost of concrete construction, to modify the properties of hardened concrete, and to ensure the quality of concrete during mixing, transporting, placing, and curing. Chemical admixtures are the ingredients in concrete other than portland cement, water, and aggregates that are added to the mix immediately before or during mixing. Most admixtures are supplied in ready-to-use liquid form and are added to the concrete at the plant or at the jobsite. The effectiveness of an admixture depends on several factors including: type and amount of cement, water content, mixing time, slump, and temperatures of the concrete and air. Sometimes, effects similar to those achieved through the addition of admixtures can be achieved by altering the concrete mixture, reducing the water-cement ratio, adding additional cement, using a different type of cement, or changing the aggregate and aggregate gradation. Admixtures are classed according to function. There are five distinct classes of chemical admixtures: air-entraining, water-reducing, retarding, accelerating, and plasticizers (superplasticizers). All other varieties of admixtures fall into the specialty category whose functions include corrosion inhibition, shrinkage reduction, alkali-silica reactivity reduction, workability enhancement, bonding, damp proofing, and coloring. Air-entraining admixtures are used to purposely place microscopic air bubbles into the concrete. Air-entrained concrete contains billions of microscopic air cells per cubic foot. These air pockets relieve internal pressure on the concrete by providing tiny chambers for water to expand into when it freezes. Air-entrained concrete is produced using air-entraining portland cement, or by the introduction of air-entraining agents, under careful engineering supervision, as the concrete is mixed on the job. The amount of entrained air is usually between four and seven percent of the volume of the concrete, but may be varied as required by special conditions. 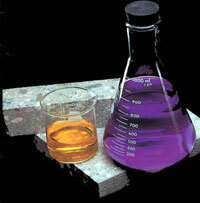 Your Kuhlman sales representative can suggest chemical admixtures that will ensure the success of your project.